Jessica tries to deal with a lot of trauma in this episode. It’s too bad that Trish is melting down and both girls are reeling; they’re too focused on their own pain to be able to help each other. Alisa’s problems aren’t helping, either. Kudos to Krysten Ritter and Rachael Taylor for their compelling depictions of their characters. Jessica’s demons are fairly easy to understand, but Trish’s behavior is more baffling to me. Sure, she has an emotionally and physically abusive mother, addiction problems, a man (Will Simpson) hunted her and almost killed her, she grew up with a troubled superhero for a step-sister, failed romances, an unfulfilled desire to be more – both in her career and as a person… huh. Okay, maybe I do understand Trish’s meltdown a little. I’m not sure that I emphasize with her desire for powers, though. Powers would be nice, but the accompanying danger, fear, regret, trauma, and responsibilities to save and not hurt everyone? Nope, that’s too heavy a burden, for me. I’m not liking how Trish is acting, especially since she’s making things harder for Jessica, but it is compelling drama that’s keeping my interest. Since Alisa has been put in prison, we get scenes with a sadistic guard named Dale Holiday. He really wants Alisa to eat that pork chop, doesn’t he? Daddy Dearest is very determined, for sure. I’m confused at first, when he first starts his abusive behavior, because he seems so reasonable and pleasant. That’s a common abuser trait, I’d assume. Acting all nice and then waiting for any little thing to be the excuse to rage and hurt someone. Alisa fights back, but can’t anymore, as Dale straps her down to be shocked, repeatedly. Alisa doesn’t make it very easy on Jessica, though. She keeps insisting that Karl’s safety is the only thing that matters to her (thanks, mom) and it takes Jeri’s help to convince Alisa to make a plan to remain in a place where Jessica can visit her mother. Poor Jessica! She’s devastated by her mom’s disregard for her feelings and the way that Alisa can’t think of anything, except for the massive love between herself and Karl. The scene with Jessica and Trish is tragic. Both ladies are so messed-up and sad. Trish feels powerless to live the life she wants, while Jess feels horrible about her powers, her past, and the actions of her screwy mother. Jessica’s shocked and concerned that Trish has been using the Combat Enhancer Inhaler, but she’s got too much on her own plate to deal with Trish. She then proceeds to drown her sorrows in a bottle of booze. Meanwhile, Trish is trying to finally get her big break. The one that will make her an influential and powerful person. Unfortunately, at ZCN, she’s nervous and fumbles her way through her audition. She’s not doing so well without that inhaler. It’s going to get worse for her, soon, and her spiraling out of control is fascinating to watch… even as I struggle to truly understand her view of her life. Malcolm and Trish – more trauma and drama. I like Malcolm, he’s a good guy that’s trying to improve his life and to help those around him, but he’s blocked at every turn by the travails of Jess and Trish. I wish that they would see him, truly see him and appreciate who he is! He’s a person with his own problems and needs, ladies! It’s not always all about you two. Oh well, sweet Mal’s headed straight into trouble… again. I’m glad that Malcolm does recognize that Trish’s too messed-up to be in a relationship with, but he’s soon sucked into another ill-advised plot and gets conked on the head, for his troubles. Things aren’t going to get easier for the poor boy in the future either, I’m afraid. Now, about Jeri. She’s a tough cookie and not easy to relate too, most times, but in this story – oh my. After Jessica reluctantly, and with sorrow, tells Jeri about the fraud of Shane and Inez – she’s trying to keep the belief going, but it’s tough. Emotions pass over Jeri’s face as she turns away. I saw hope and fear, plus her horrible dawning realization of the devastation to come. When she arrives at her home and can see from the doorway that Jessica was right – her shock and horror is palatable. Inez and Shane took everything from her. Not just her personal belongings, but her hope and optimism for the future. She’s betrayed by people that she dared to trust and let into her life. The beauty of the shot, where Jeri sinks down to the carpet to scream and sob, is spectacular. Watching this show, I never thought I’d cry for Jeri Hogarth. Things get even crazier when Trish goes to visit Alisa in prison. Right away, Trish is antagonistic and inflammatory. Don’t get the homicidal maniac angry, you idiot! Alisa claims that Jess will always choose her over Trish, yet that rings false when Alisa doesn’t have an easy time choosing Jess over Karl. She did finally agree to help Jessica get him to safety, someplace far away, though. Still, I have problems believing how sincere Jessica’s mom is about being on her daughter’s side. It seems more like she’s just jealous of Trish. Poor Jessica, she’s told to her face – over and over – how awful her mom is, by multiple people. Inez is her usual nasty self and Trish’s no better. Crazy Trish’s adamant that Alisa is an unrepentant murderer and that Karl cannot get away with his crimes. She must find him! Sheesh, calm down, lady. Jessica’s trying to understand her mother and people keep piling it on about how awful Alisa is and how Karl must be punished. No wonder that Jess loses it when she sees Oscar in the elevator. I’m always a sucker for a scene when a man says “come here,” and enfolds a traumatized woman into his arms. Jessica sobs and I feel terrible for the pain that she’s going through. Oscar’s a good man, hope he stays that way. The episode concludes with Jessica making a visit to Dale’s place. She knows he’s hurting her mom and wants to find out his story. She finds evidence of his sordid past but gets surprised by him. It’s awful watching Dale almost take-down Jessica, yelling the whole time that he’s killing her in self-defense. Jessica finds a way to defend herself, but the consequences of those final minutes will haunt her, that’s a surety. Alisa is Prisoner 46592. She has the strength to bust out of there, but at last, she listens to reason and plans an escape for Karl, with Jessica, through some very interesting verbal code. It’s centered around a vacation spot from Jess’s childhood. Great scenes and sets in those rooms. Trish’s in trouble from that inhaler. It contained toxins too dangerous for any human to ingest. Uh oh. Karl and Alisa were married in the Paradise Suite. She carried him over the threshold, ha! I don’t know how to feel about the deep love that Karl and Alisa have for each other. It seems genuine and is it totally wrong because of the circumstances in which it developed? Dr. Frankenstein made her a monster, but Alisa doesn’t seem to blame him for anything. Inez: “That thing that attacked me is your mom? I hope they lock her up and melt the key down for bullets.” What a meanie! Trish: “She’s not who you think she is." Jessica: “She is my mother. She is mine to deal with, you do not get a say.” You tell her, Jessie. There’s a bunch of happenings in this one that moves the story along nicely, I thought. Even though the motivations of Trish and Alisa are confusing, I’m still fascinated and intrigued about the plot developments brewing. 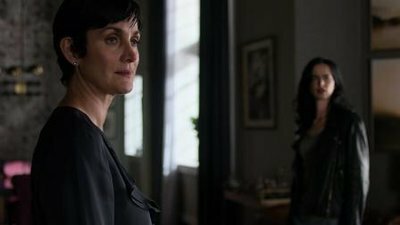 Even though this season doesn’t have a truly wonderful central story, like Hope Shlottman and the omnipresence of Kilgrave, I’m still enjoying watching Jessica learn to cope with a mother that is so different, yet so familiar. Four out of five Pork Chops. Watching this show, I never thought I’d cry for Jeri Hogarth. Yes, indeed. This was a depressing episode. Jessica still can't handle killing Kilgrave, and now she's killed the horrible guard, too. It's like it doesn't matter that they were both despicable killers. And Jeri realized that Jessica was telling her the truth and she hadn't been healed. The way she collapsed on the floor in tears was just shattering because it was so unlike Jeri. And Trish hurt Malcolm in order to get to Karl. How could she? Poor Malcolm can't catch a break. So I guess I'm right that Trish will become an antagonist. Let's just hope the inhaler is not fatal.